Oolong tea is a Chinese tea that has cultural significance in China and several other parts of South East Asia. The word ‘oolong’ comes from ‘Oo’ (or wu) meaning black, and ‘long’ meaning dragon, which may refer to the long, dark and curled nature of oolong tea leaves. This poetic name provides a telling picture of the role that Oolong tea plays in Chinese culture. On the spectrum between black tea (oxidised) and green tea (unoxidised), Oolong sits somewhere between. The tea, depending on the method used for brewing, and the level of oxidation it undergoes (this can range from as low as 15% to as high as 75%), takes on different flavours. The minimally oxidised oolong tea is lighter and more floral, while the more oxidised versions tend to be full bodied and fruity. Like black tea and green tea, oolong is also made from the leaves of a shrub called Camellia sinensis. The main regions that produce this tea are Fujian and Guangdong provinces in China and Taiwan. Oolong tea is said to have originated in the Beiyun region of Fujiyan province. This southeastern region has a long tryst with tea, due to its mountainous terrain and climate that is optimal for growing tea. Beiyuan tea, which was one of the first tribute teas – teas that were gifted to the Emperor of China – originated in this region. 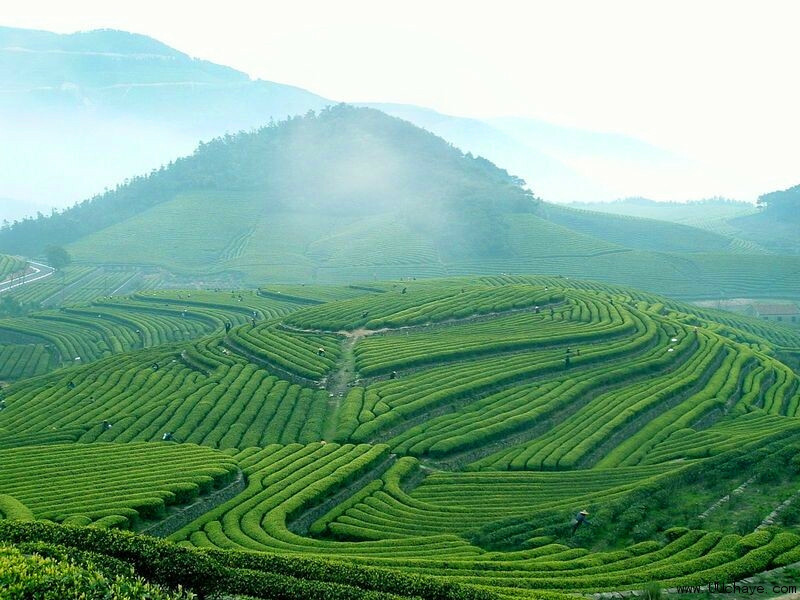 The northern region of Fujiyan, Wu Yi Shan, was also well known for making tea cakes or compressed cakes of tea. In this method, the leaves were pressed into shape, and then stamped. This type of tea was usually whipped, much like matcha is steeped today. Interestingly, an alternate etymology theory has it that ‘black dragon’ refers to the symbol that was stamped on the cake, rather than the shape of the tea leaves. 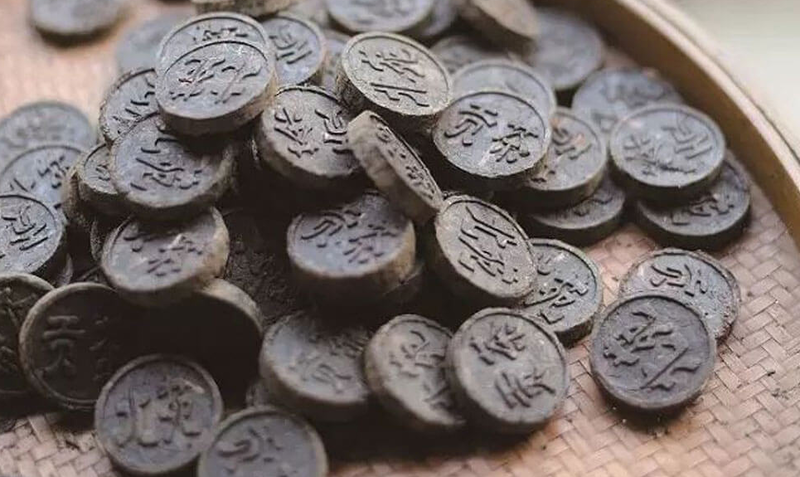 However, during the Ming Dynasty (1368-1644), a ban on compressed tea cakes was issued in order to put a stop to corruption and the monopoly in tea trade. Rather than simply dying out, the tea industry thrived in new ways – charcoal began to be used to roast tea. This is one of the defining factors (along with the semi oxidisation) of oolong tea. Although it isn’t known for sure when oolong tea was first invented, it’s early name, Rock Tea appears in a poem written in the late Ming Dynasty. It is from this region that the technique for making oolong tea spread to other parts of China and Taiwan. Taiwan, to this day, is also an important player in the oolong tea industry. It spread to the West in the in the centuries that followed, and in the 19th century, an English ambassador is said to have gifted this precious tea to the Queen of England who took a liking to its unique flavour. Tea in general plays a central role in Chinese culture, and is important in social, business and domestic settings. However, oolong tea in particular is a prized tea that serves as a social status indicator. It is an integral part of certain tea ceremonies, like the Gong Fu Cha. Literally translating to ‘made with skill’, this is a tea ceremony that originated in the Fujiyan region and Guangdong – both regions that are renowned for their oolong tea. As with all tea ceremonies, the goal here is to pay attention to details and escape the pressures of daily life for a few minutes. 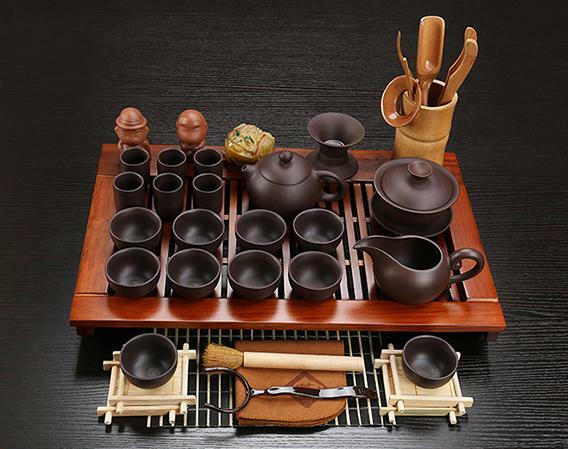 The basic Gong Fu Cha tea set has cups, a teapot and a brewing tray that has slats on top to catch any excess water or tea that may spill during the ceremony. However, a more elaborate one will have the following: a server to decant the tea and to stop the steeping process; a scoop to measure out the tea leaves; a scent cup (to appreciate the aroma ofthe tea leaves); tongs to handle the cups when they’re being rinsed, and tea towels to wipe up any spills. The teapot is traditionally made from Yixing clay, and can hold between 100-150 ml of liquid. Both the teapot and teacups are miniature in size and usually have intricate patterns – aesthetics is an integral part of the tea ceremony. While the actual ceremony differs from region to region, the philosophy is the same – tea is steeped in small concentrated quantities, which allows for the flavours to shine through. Water is poured onto the leaves in many rounds, and the different flavours and aroma that arise each time are to be enjoyed. 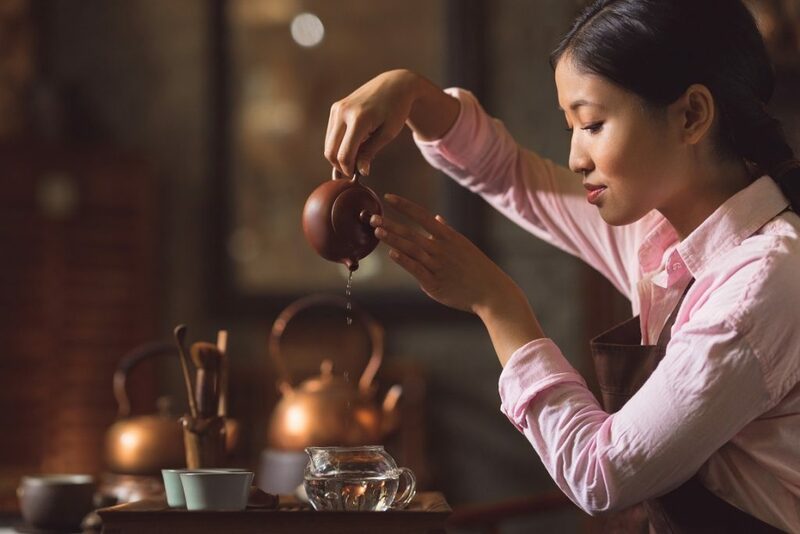 Unlike the Japanese tea ceremony which is very rigid, the Gong Fu Cha is not as formalized, and only includes practical steps that truly bring out the best in the tea. When drinking tea at a Gong Fu Cha it is integral to sip slowly, and slurp the tea, allowing tea as well as air into your mouth. It is said that this is best way to taste the more delicate flavours of the tea. Although oolong tea has long long been popular in parts of Asia – you can order one at a McDonalds in Japan – it has been gaining popularity in other parts of the world only recently. Part of this has to do with the fact that the Western palate has so far only been accustomed to black tea and green tea, and oolong has a far more complex and multi-faceted flavour than both. Although oolong tea is said to have medicinal properties and aid in weight loss, there is no concrete evidence to prove this. However, it has been used in aiding digestion and generally cleansing the digestive system for hundreds of years. The more lightly oxidised versions are said to help the respiratory systems as well. If you’re new to oolong tea, making it at home may seem a little intimidating to begin with. However, keeping in mind certain important points will help you make the perfect cup. To begin with, start with a tea that has flavours that appeal to you – one with notes of honey, and have a fruity finish is a good choice. The general rule of thumb is to use 3 grams of tea for 200 ml of water. Bring cold water up to 80 degrees Celsius and pour carefully over the leaves. If using a glass teapot, the unfurling of the leaves as it steeps is a wonderful sight! Oolong is also unique in that it can be rebrewed over and over again, the flavour becoming stronger each time — perfect for a long afternoon tea session. Although not traditional, the complex flavours of oolong tea also make it perfect for an iced tea in the summer months. Steeped in tradition and history, oolong tea generally has a reputation for being esoteric and sophisticated. However, it is also a tea that is easy to appreciate – with strong aromas, a glossy vibrant colour and a wide range of notes, you simply need to find the right one for your palate.